When I was a kid in the 1970s, I remember getting perhaps about 50 cents per tooth from the tooth fairy. I was a bit surprised when I heard from colleagues and friends that the cost of one tooth has gone up since than to about 5 dollars. According to Delta Dental, a national dental insurance company, the current national average cost of one tooth is $4.66. Delta Dental has been putting out a survey every year since 1998 to see how much money the tooth fairy leaves behind for one tooth. You can complete their survey here as well! 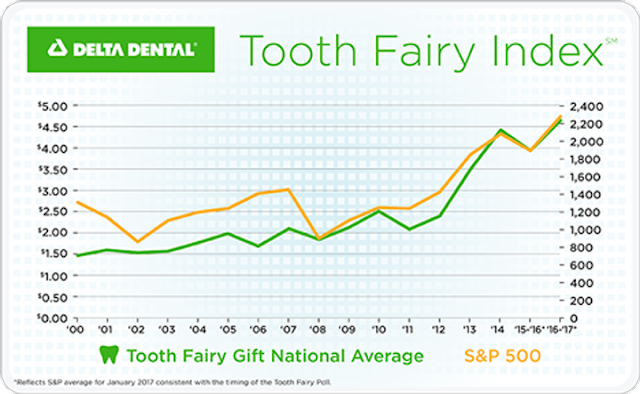 Check out the graph they have put out showing the S&P 500 and tooth fairy gift amount over time. Given the close correlation, how much money a tooth fairy leaves is an accurate predictor of how well the economy is doing overall! Or, one can consider the tooth fairy gift amount in terms of inflation; it is about 10% per year. Overall inflation in the US economy is about 2% per year. Health insurance inflation rate fluctuates between 2-4%. College tuition inflation rate is about 5%.